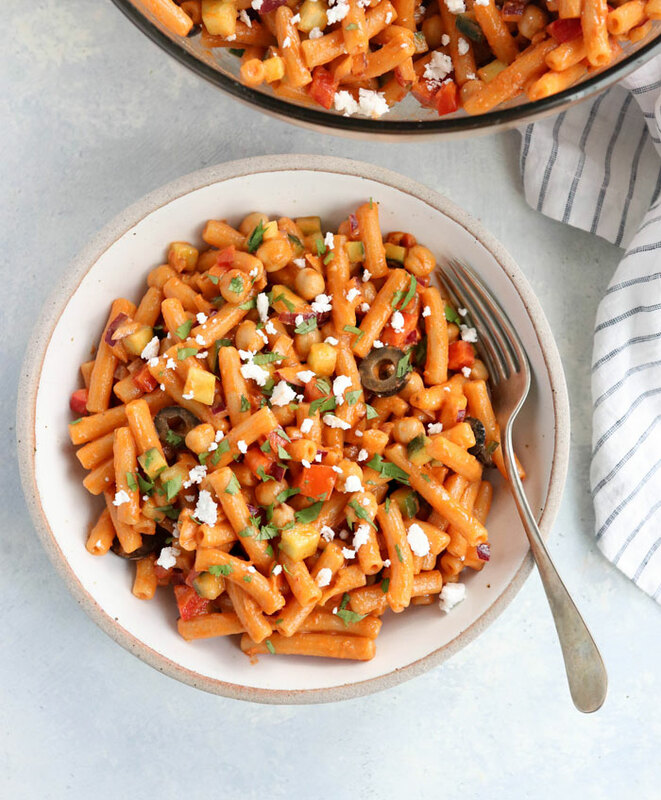 This Sun-Dried Tomato Pasta Salad is a flavorful make-ahead lunch. 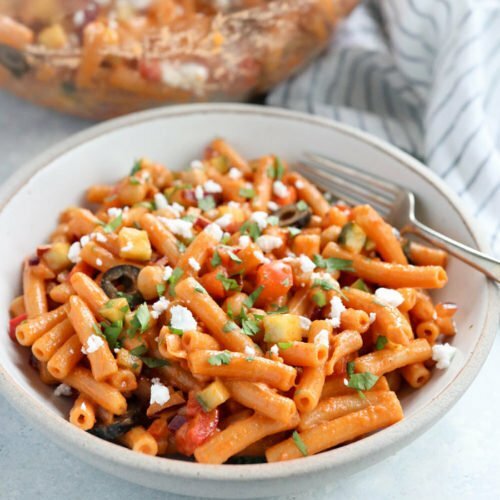 It’s bursting with fresh Mediterranean flavors, and packs a hefty serving of plant-based protein in each bite. What I love about this salad is that it’s extra-filling thanks to the addition of pulses. Pulses are the protein-packed and sustainable foods known as dry peas, chickpeas, lentils and beans. 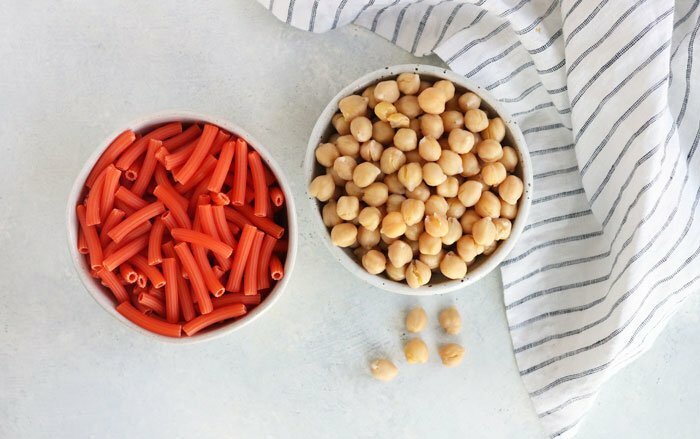 In this recipe you’ll benefit from two types of pulses, in the form of red lentil pasta and chickpeas. Chickpeas, also known as garbanzo beans, are a great source of fiber and plant-based protein, as well. Like lentils, they are an excellent source of folate (1 cup contains 90% of your daily recommended intake) source of iron, vitamin B-6, and essential minerals like magnesium and zinc. 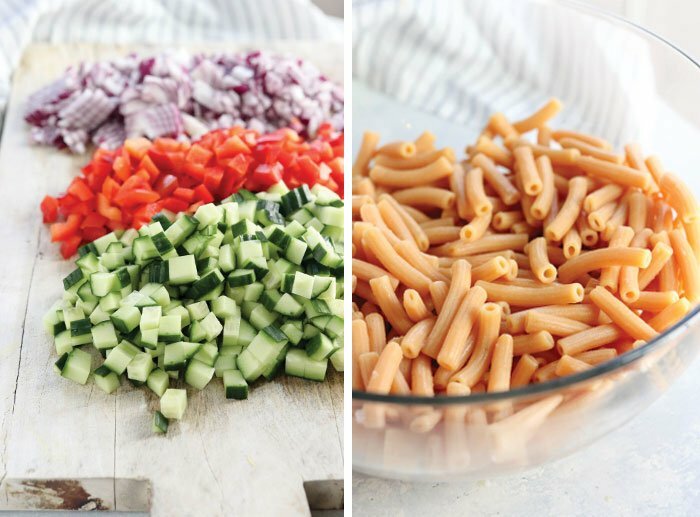 I love how quickly this pasta salad comes together. Simply cook the pasta according to the package directions, and while that’s simmering on the stove (watch to make sure it doesn’t boil over) you can whip up the dressing and chop the veggies that you’ll be adding in. When shopping for a pulse-based pasta I usually check the back to see that there’s only one ingredient on the label. In this case, the pasta I’m using is made with organic red lentil flour, but you can use any variety that you like. I hope you’ll enjoy these protein-packed meal soon! While the pasta is cooking, you can chop the cucumber, red pepper, and red onion and add them to a large bowl as you go. Stir in the chickpeas, too. To prepare the dressing, combine the sun-dried tomatoes, olive oil, water, garlic, salt, oregano and maple syrup. 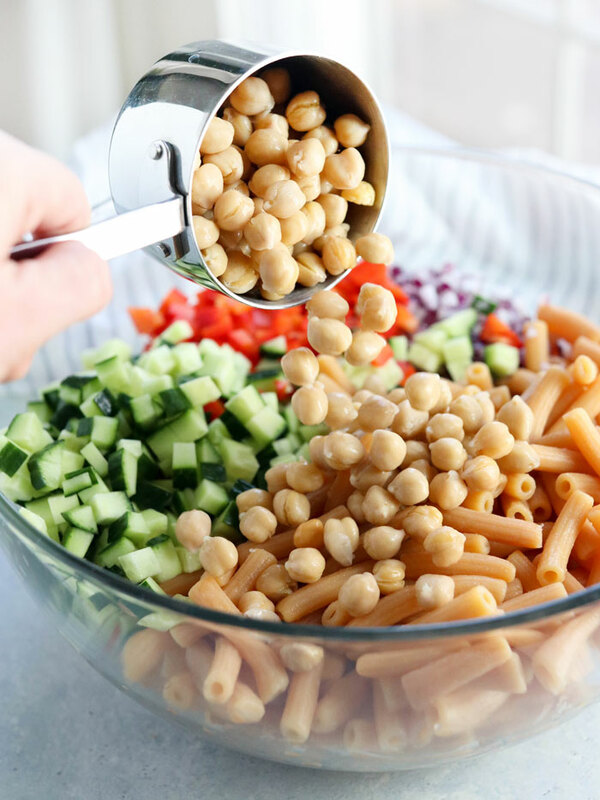 When the pasta is done cooking, drain it well when add it to the large bowl with the vegetables and chickpeas. Pour the dressing over the top, and toss well to coat. Add more salt, or some freshly ground black pepper, to taste. Transfer the salad to the fridge to chill it until you're ready to serve, at least 2 hours. Add sliced olives and feta cheese, if desired, right before serving. This salad should keep well in the fridge for at least 3 days in airtight container. Looking for more easy ways to incorporate pulses into your day? Sign up for the Half-Cup Habit today and see how easy it is to add 1/2 cup serving to your day, 3 times a week. This recipe is a great place to start! 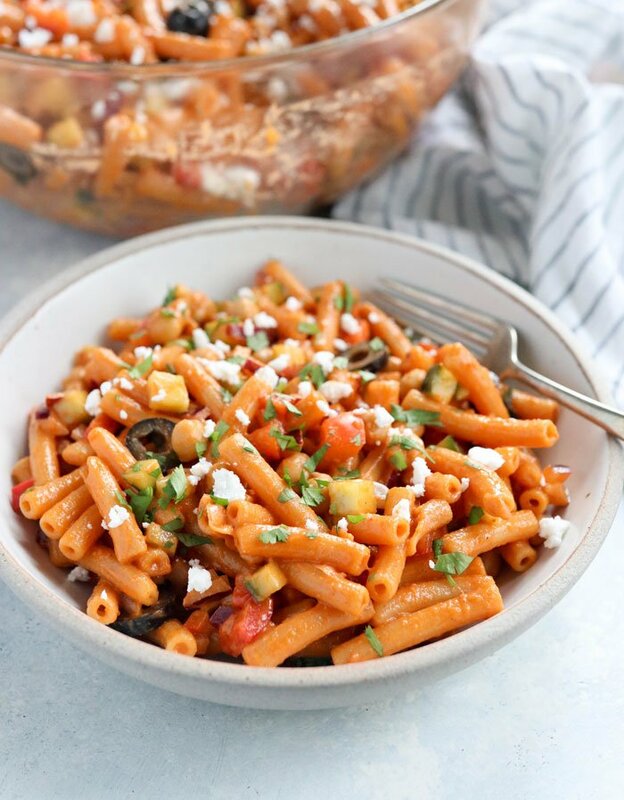 Reader Feedback: Have you tried a pulse-based pasta yet? Let me know your favorite way to use it! Are the sun dried tomatoes dry or in oil? I tried this recipe today, and I love it! I did everything exactly as written, and that dressing is lick-the-bowl good. It kinda reminds me of pizza! I’m using the rest of it as a packed lunch this week, so thank you! When you say combine the ingredients for the dressing do you mean blend them together? Or just leave the sun dried tomatoes as they are and simply mix with other ingredients?